The Pozytywny Mokotów will have 7 residential buildings. The project is divided into 3 stages. The buildings will be erected on the plan of the letters L and C and will be open to the inside of the estate. On the side of the streets, they will form a frontage with retail units on the ground floor. Close to the street, next to the entrances to the complexes, small squares will be built to ensure a friendly atmosphere. 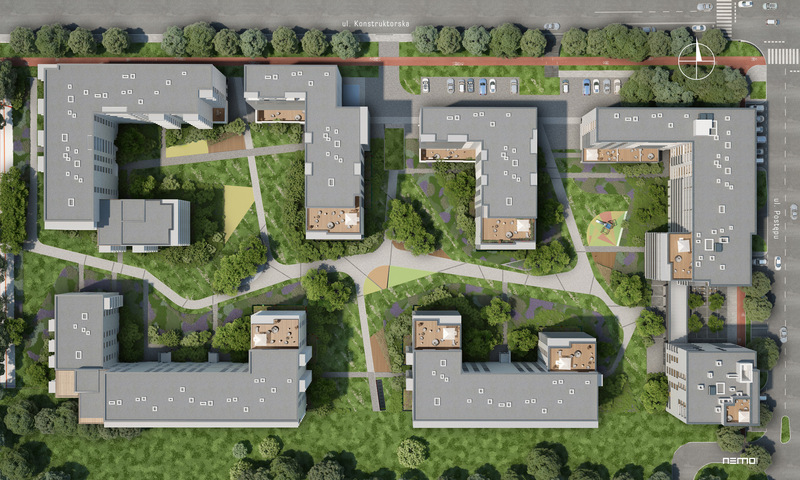 As part of Stage I of the Pozytywny Mokotów project, 125 apartments will be built, having from one to five rooms and an area from 33 to 114 square metres. The apartments will be professionally finished, with many arrangement options and optimum exposure to sunlight. Every apartment will have a spacious loggia or a balcony. 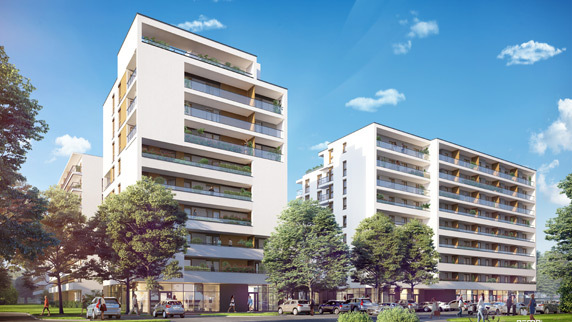 The top floors will feature apartments with large terraces facing the green yard in the middle of the complex. The Pozytywny Mokotów is being developed at the corner of ul. Konstruktorska and ul. Postępu. There are bus and tram stops close to the estate. You are just two tram stops away from the Metro Wilanowska underground station. The Pozytywny Mokotów also means close access to the main vehicular traffic arteries of Warsaw and the proximity of an international airport. Bio Bazar - market place 8 min. Galeria Mokotów shopping centre 12 min. Wilanów Park and Palace 16 min. Sadyba Best Mall shopping centre 16 min. Powsin Culture Park 16 min. Służewiec Horse Racing Track 10 min. Pole Mokotowskie Park 12 min. Arkadia Park – ponds under Królikarnia Park 13 min. Wierzbno metro station 13 min. Dworzec Centralny railway station 23 min. The surroundings bustle with life. There many offices, schools, kindergartens, and retail units (small stores, restaurants, cafés, sports clubs) here. You need just a few minutes on foot to get to the Galeria Mokotów, one of the most popular malls in Warsaw. Another great asset of the Pozytywny Mokotów is the proximity of large, attractive parks. The Arkadia Park with the Królikarnia palace and the Dolinka Służewiecka Park are outstanding places that offer a wide range of possibilities: from relaxing in the bosom of nature, through doing sports, to open-air concerts. The legendary Służewiec Racecourse is also located close to the Pozytywny Mokotów, which horse riding fans will appreciate. All apartments in Pozytywny Mokotów were equipped in FIBARO system. Currently is the best building automation solution available on the market. The Pozytywny Mokotów is a place with its own micro-climate. The open areas of the complex are designed to form a quiet, natural garden rich with plant forms and varieties. Bushes and cover plants will dominate here. They will be supplemented with blooming, colourful perennials and decorative grass beds. The alleys will have trees planted alongside them to provide pleasant shadow on hot days. Farther away from the main paths, there will be small hills with gentle slopes featuring higher trees. (vis a vis office building at Konstruktorska 4 St).